For much of the world, Cuba is a relatively unknown tourism destination, and there remain many negative misconceptions. However, in spite of this, Cuba has experienced a tourism boom during the last eight or nine years, the likes of which have been rarely seen before. Take, for example, the growth in tourist arrivals which has increased from just over 300,000 in 1988 to more than 1 million in 1996, representing a compound annual growth of 16%, more than three times the level of global and Caribbean tourism growth. Significant as this may seem, it should also be noted that this has been achieved with virtually no travel from the vast U.S. market. Unlike many of the Caribbean countries, Cuba has a substantial land mass, comprising 111,000 sq. km. and with a distance of approximately 1,250 km. from end to end. The country has a population of some 11 million people, making it by far the largest in the Caribbean (Dominican Republic and Haiti has population of approximately 7.5 million while Jamaica has 2.5 million). The country has diverse geographic regions, all with various tourism appeal, including an estimated 300 beach areas, mountains, tropical rain forests and arid flat lands. Similarly, the range of tourism attractors include an extensive supply of the traditional sun/sea/sand experiences, as well as worldclass activities such as diving and fishing, while cultural and other attractions are still in the emerging stages. The recent targeting of tourism as a key industry for the future development of the country has resulted in implementation of various legal and political reforms which are still evolving. However, the past growth in tourism and expectations for the future are impressive by any measure. While Cuba has many economic and social problems, it is evident that there is a huge level of interest in travel to the country. While competing to a great extent with tourism destinations elsewhere in the world and, more particularly in the Caribbean region, Cuba has many attributes which provide it with distinct advantages. In particular, the geographic diversity, enormous range of existing and potential attractions, cultural and architectural history and combination of educated workforce and low incidence of crime, make Cuba an appealing destination today. Future improvements to the infrastructure will continue to add to the appeal of the country, and it has the potential to become the dominant tourism destination in the Caribbean if made available to the U.S. market. The following sections examine the recent evolution of tourism in Cuba and detail some of the key trends that have occurred. 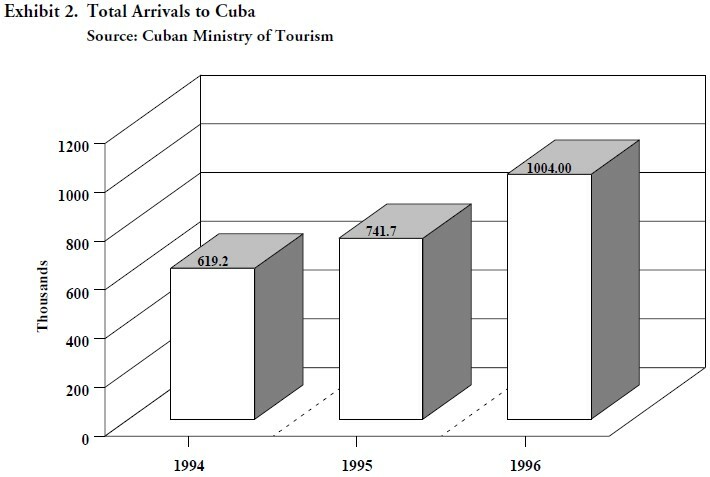 Exhibit 1 graphically portrays the increase in tourism arrivals to Cuba from 1988 to 1996, while Exhibit 2, compares the results for 1994, 1995 and 1996. As indicated, total tourism arrivals increased from 309,200 in 1988 to 546,000 in 1993, representing compound annual growth of 12%. In 1994, the number of arrivals increased to 619,200, representing growth of another 13%, while 1995 results show the total number of arrivals was 741,700, up by 20% over the year before. One of the reasons for the larger than average increase in 1995 was the result of hurricane damage to several other Caribbean islands in late 1994, causing demand to be redirected from these other destinations during the late winter and early spring periods of 1995. Visitation levels in 1996 reached 1,004,000 people, an increase of 35% over the previous year, placing it fifth on the list of most visited countries in the Caribbean, behind Puerto Rico (3.1 million), Dominican Republic (1.9 million), the Bahamas (1.6 million) and Jamaica (1.1 million). An analysis of tourism arrivals indicates that in 1988, 56.0% of all arrivals came from Europe (173,000), followed by 17.2% from Canada (53,000), 11.3% from South America (35,000), 9.1% from Mexico (28,000), and 3.2% from each of the United States and ‘Other’ regions (Exhibit 3). Statistics for 1995 (data for 1996 was not available at the time of preparing this report) reveal that Europe’s market share has declined, to 47.3% of total visitors, although the absolute number of arrivals continues to grow at a high rate, reaching 351,185 and reflecting annual average growth of 10.6% since 1988. Canada, which has historically represented the single largest source country for tourism to Cuba, has increased its market share from 17.2% to 19.4% of all arrivals, with the absolute number growing by an average of 15.4% annually, to a level of 144,113 in 1995. 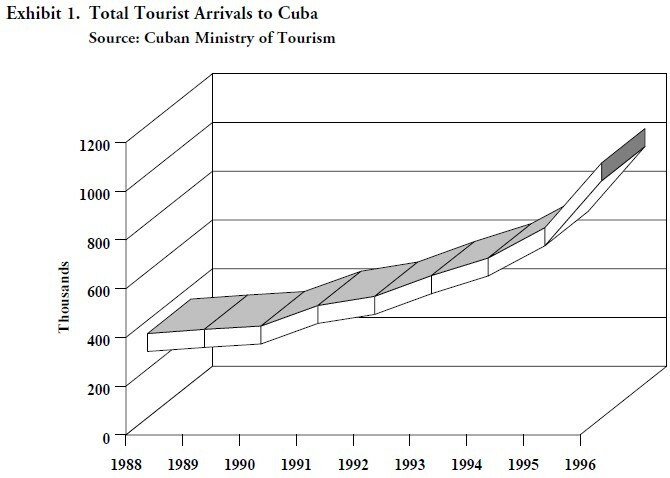 Other markets represented 10,000 arrivals in 1988, but has since grown to 110,440 arrivals in 1995; this reflects average annual growth of 40.9% with the result that Other now represents 14.9% of all visitors to Cuba. South America has grown from 35,000 arrivals in 1988 to 83,157 in 1995 representing growth of 13.2% annually. South America now generates 11.2% of all tourist arrivals to Cuba. Mexico has demonstrated less aggressive increases, having grown to 31,838 arrivals in 1995, up from 28,000 seven years earlier. Mexico now represents 4.3% of all arrivals, down considerably from the 9.1% of all arrivals in 1988. As may be expected, the U.S. market is currently a nominal market for Cuba, with the annual level of visitation typically being in the 10,000 to 20,000 range. 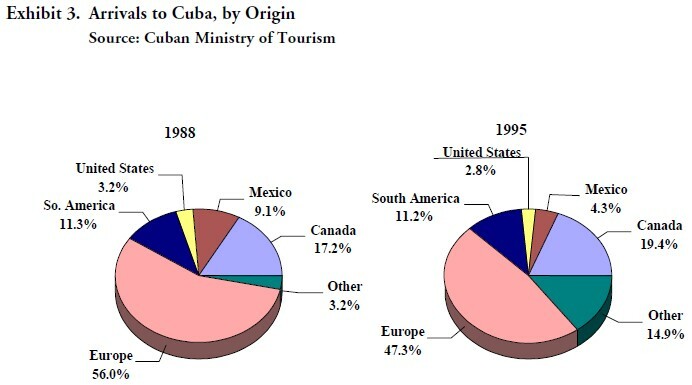 In 1995, the U.S. represented 2.8% of all arrivals in Cuba. As may be expected in a Caribbean destination, the majority of visitors arrive during the colder months of the northern hemisphere, with the November through March period being the busiest. However, the success of Cuba in targeting the European market, which typically vacations during the summer, has resulted in strong visitation levels from this area in July and August. Visitation levels during the first half of 1994 and 1995 tracked very similar patterns; however, during the latter part of 1995, there was a dramatic increase in visitors, with individual months showing growth of 50% to 80% over the previous year. Results for 1996 show a similar pattern, particularly during the early part of the year, with 1996 far surpassing the prior two years’ results. 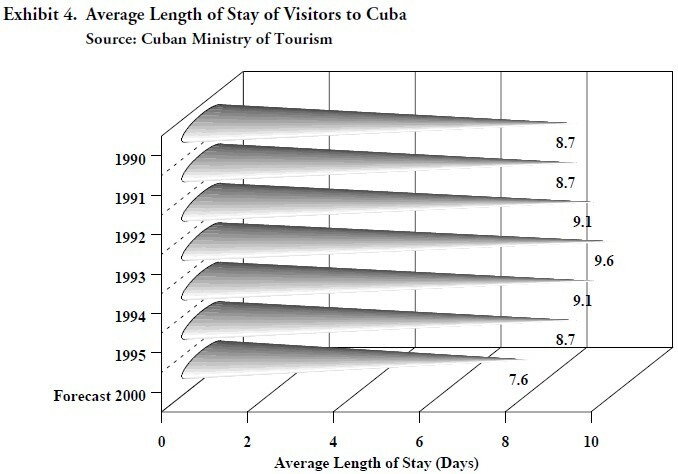 In Exhibit 4, we illustrate the average length of stay by visitors to Cuba over the period 1990 to 1995. As shown, the average stay increased from 8.7 days in 1990 to 9.1 days in 1992, before reaching a peak of 9.6 days in 1993. Since then, the typical visit has declined in duration, reaching 9.1 days in 1994 and 8.7 days in 1995. The Ministry of Tourism projects that at the end of the millennium, the average length of stay will have declined to 7.6 days. At whatever point the U.S. embargo may be lifted, it can be expected that there will be a material change in the average stay. As evidenced in the Bahamas, for example, which is so close to the United States, the average length of stay is approximately 5.8 nights, with the U.S. market staying 4.7 nights in Nassau, 3.4 nights in Grand Bahama Island and 4.5 nights in Paradise Island. The average stay in Puerto Rico (where 70% of all visitors are from the U.S.) is 2.8 nights, and in the U.S. Virgin Islands (85% of visitors from the U.S.) is 4.4 nights. It is expected that in a post-embargo period, Cuba’s average length of stay would decline quite significantly, and we estimate that it will likely reach 7.2 nights. 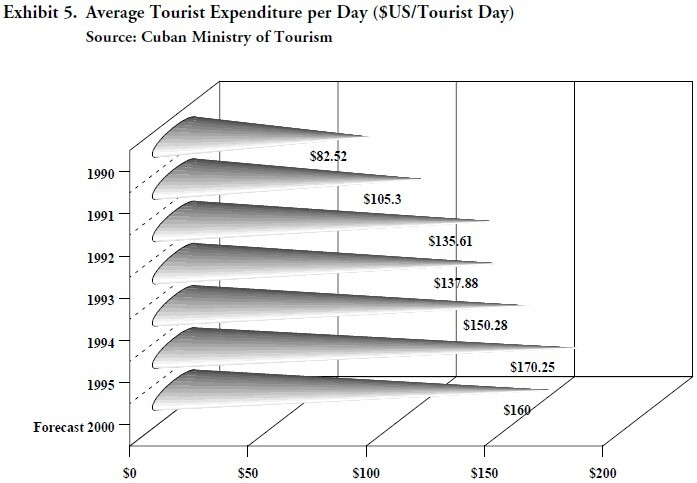 Information provided by the Ministry of Tourism indicates the average tourist expenditure per day has increased from $82.52 in 1990 to $170.25 in 1995. The graph in Exhibit 5 illustrates this trend. As indicated, there were substantial increases, of 28% and 29% in 1991 and 1992, respectively. However, there was virtually no improvement in 1993 (2%), while the following year saw an improvement of 9%, to $150.28. The average tourism expenditure in 1995, at $170.25, was 13% more than the year before. In its projection for 2000, the Ministry believes the average expenditure will decline to approximately $160.00. We believe this to be understated—if inflationary expenditures alone are achieved, and inflation is assumed to be 2% annually, then the average tourism expenditure in 2000 would be $188.00. Considering the recognition of Cuba as an inexpensive destination, the stated objective of the Ministry to increase prices of hotels to a more acceptable level, and the development of more modern hotels and resorts (such as the Meliá Cohiba, Meliá Las Américas and Sol Meliá, etc. ), we believe the average expenditure will increase well beyond that indicated. In a recent study, it was identified that there were approximately 34,000 hotel rooms in Cuba at the end of 1993, of which some 6,500 were operated by local municipalities for use by Cubans, as were a further 2,000 rooms under the control of Islazul (a hotel chain with properties targeted towards national tourism only). Since that time, a number of hotel rooms have been deleted from the supply, while others have been added. Because of the continual fluctuation in supply, in part due to the qualitative assessment of what really constitutes product suitable for international tourism, we provide a table (Table 1) that quantifies the number of hotel rooms, by geographic region, as provided by the Ministry of Tourism. As shown in Table 1, the total number of rooms available has increased from 12,866 in 1990, to almost 27,000 in 1996. This represents annual average growth of 9.7%, a level below the rate of growth in tourism arrivals. The Ministry also anticipates there to be 49,556 hotel rooms available for international tourism in the year 2000, equating to further increases in supply each year of approximately 15%. The inventory of hotel space is divided into different categories, according to quality levels. In keeping with the hotel industry elsewhere in the world, Cuba has adopted a star rating system, and the data in Tables 2 and 3 illustrate the segmentation of hotels and hotel rooms according to this star rating. It should be noted, and this is commented upon elsewhere in this report, the star rating system applied in Cuba is slightly more generous than in many other destinations, typically showing one full star above the quality that would be expected in the international markets. Of the 26,878 hotel rooms available in 1996, 13% are categorized as 2-star, 28% as 3-star, 47% as 4- star, and just 12% as 5-star. Similarly, further analysis reveals that over two thirds of all 4-star hotels and all 5-star properties are located in either Havana or Varadero, the main destinations for tourists. The principal hotel companies in operation in Cuba are Cubanacán, Gran Caribe, Gaviota, Horizontes and Marinas Puertosol. Cubanacán was the first of these to be formed, having been created in 1987 following the attempt by the Ministry of Tourism (‘Intur’) to apply ‘private sector’ management to certain hotels. Following recognition of the success of Cubanacán, a second company—Gaviota—was formed in 1989. In early 1994, Intur was dismantled and in its place, three new hotel companies were formed: Gran Caribe, Horizontes and Islazul. The main hotel companies operate different quality hotels at different locations throughout the country. However, as a generalization, Cubanacán primarily operates 4- and 5-star hotels, with a concentration in Havana, Varadero, Santa Lucía, Guardalavaca, Granma and Santiago de Cuba. Gran Caribe operates primarily 4- and 5-star hotels in Havana, Varadero and Cayo Largo, while Gaviota operates 3- and 4-star products in Varadero, Sancti Spíritus and Guardalavaca. Horizontes is most well recognized for its 3- star hotels, with properties in Pinar del Río, Havana, Playas del Este, Matanzas, Varadero, Cienfuegos, Sancti Spíritus, Camagüey and Holguín. World tourism spending has been growing at a rate of over 12% annually over the last 45 years, while the number of tourists has grown by 4.4%. The World Tourism Organization projects international tourism arrivals will reach over 1 billion within the next thirteen years, with receipts reaching $1.5 trillion. The Caribbean is one of the most well-established and popular sun destinations in the world. Tourist arrivals reached 14.7 million in 1995, an average increase of 4.9% annually, higher than the global average. • Within the Caribbean, Cuba has significantly outperformed the majority of other destinations in terms of tourism growth. Annual growth over the last seven years has been 16.9% in Cuba, compared to 6.4% for Jamaica, 4.7% for the Dominican Republic, and 3.4% for Puerto Rico. The Bahamas recorded growth of less than 1%. • The U.S. market represents the single largest source of tourism to the region, with some 7.3 million total visitors. Remarkably, Cuba’s strong performance has been achieved in spite of the absence of this market. • U.S. visitation levels to the Caribbean continue to grow, although this country’s market share has declined. Stronger growth from other markets, particularly Europe, are expected to result in the U.S. share being approximately 51% in 1996, down from over 58% in 1988. Cuba has tremendous diversity in its tourism product, offering a considerable variety of traditional sun/ sea/sand experiences with historical and cultural attractions, sporting activities and forms of adventure tourism. The country is substantial in size, geographically close to the North American market, relatively crime free, and has a well educated workforce. • Tourism arrivals have grown from 309,000 in 1988 to almost 1 million in 1996. • In the last three years alone, tourism volumes have increased by 13%, 20% and 30% respectively. • There are approximately 27,000 hotel rooms available today that cater to the international market. However, most of this product is characterized by Cuban 2-, 3- and 4-star quality that has limited appeal to the more discerning traveller. • Our research has indicated that Cuba is still regarded as an inexpensive ‘package’ destination. This is a reflection of the initial tourism strategy of quickly penetrating source markets by offering low, all-inclusive prices, and the lingering impacts of this strategy. • While some good quality hotels exist, the ability to leverage prices today is hindered by the lack of quality in product and services in other tourism sectors. Building high quality accommodations alone will not satisfy tourists if other aspects of the tourism experience are below acceptable levels; this includes food and beverage operations, retail facilities, recreational and entertainment activities, and other tourism infrastructure. In our analysis of demand for higher quality hotel product in Cuba, we have measured growth in tourism in the Caribbean region, the likely performance of Cuba in this market, and the resultant demand for all types of hotel space as a result of the expected visitor levels. We then ascertained the extent of 4- and 5- star accommodations currently available in the Caribbean region, as well as the demand for such product. Utilizing Cuba’s projected market share, we have then determined the number of new 4- and 5-star product which is supportable in the country. • Caribbean tourism is expected to grow to 20.8 million visitors by 2003, with Cuba reaching 2.2 million. Under the assumption the U.S. embargo is lifted by 1999, Cuban tourism could reach 3.7 million by 2003. • There are approximately 38,000 high quality hotel rooms in the Caribbean, and an equal number in Mexican resort areas. The competitive supply, representing some 76,000 rooms, operates at about 63%. • Our projections indicate demand for this quality product will reach 24.8 million room nights in 2003. • Based on Cuba’s equal share of total tourism, this would indicate demand of 1.8 million room nights of demand for 4- and 5-star product in 1999, reaching 2.6 million by 2003. • If the embargo were to be lifted by 1999, demand could reach 2.7 million room nights in 1999 and 4.5 million in 2003. • On the basis that any new hotels would operate at 75% occupancy (the typical level at which cash flows generate good returns on investment), there would be a need for 3,700 new rooms of this quality by 1999, and 6,700 by 2003. If the embargo were to be lifted, the requirement is 7,100 new rooms by 1999 and 13,600 by 2003. The determination of room demand is based on the assumption that there will be considerable improvement to the tourism infrastructure in Cuba. It also assumes that Cuba will attain its equal share of the available market; however, we believe that if the infrastructure improvements are made, Cuba has the potential to obtain more than its equal share. The amount of high quality rooms supportable in Cuba is much higher than the number of hotel and resort developments in process today, suggesting there is considerable market potential for new projects.